P-2822. A FINE JALISCO STANDING WARRIOR, AMECA- ETZATLAN STYLE, PROTOCLASSIC, ca. 100 B.C. to A.D. 250. Provenance: Acquired from a Private Santa Fe, New Mexico Pre-Columbian Art Collection formed during the 1960s-‘70s. 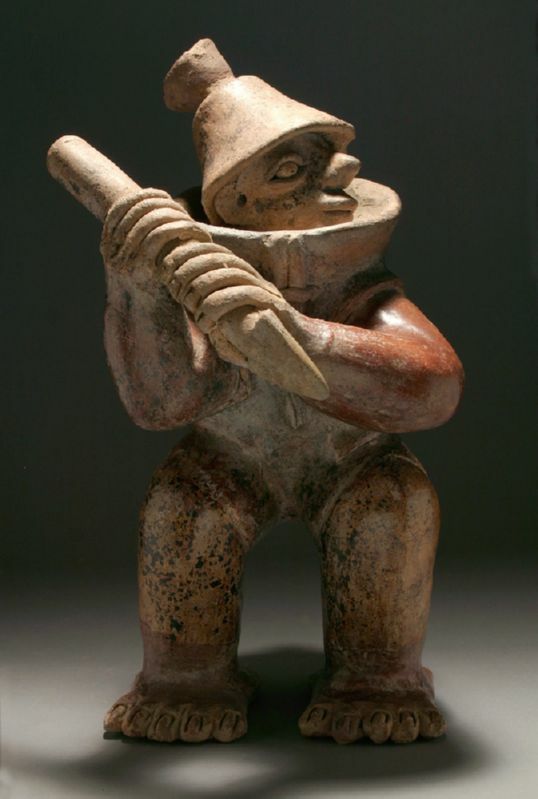 This Jalisco warrior is standing at a ready defensive posture, grasping his spear with both hands. He is wearing a decorated helmet and barrel armor, and is pigmented red, brown and buff with remains of black. Since the orientation of the stance and spear is always to the left, it has been suggested by scholars that the “warriors” may actually represent “tomb guardians” with shamanistic powers, protecting the dead from evil forces.